Pink Floyd began a week-long stint at Abbey Road Studios, with engineers John Leckie and Peter Bown, recording ideas for their next album, Meddle. Pink Floyd returned to Abbey Road Studios for a week's recording session. Further recording sessions took place throughout the month. Pink Floyd went to North London's Morgan Sound Studios to continue work on Meddle, including final mixes for the track Echoes. Meddle was released in the US, a week ahead of the UK. It reached No. 70 in the charts. 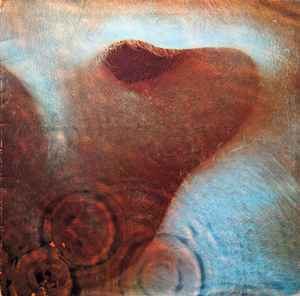 Meddle was released in the UK and reached No. 3 in the charts. Anyone else have a misprint of this EU version? Mine has side 1 label on both sides. Music is correct though. Sonics are stunning! I mostly went back and forth with what I feel are the most revealing tracks, Fearless and San Tropez. To start with the UK, I observed that it has a lot less deadwax, making more room for dynamics to breathe. But in actuality this difference is very minimal and might not even matter as the reissue is just cut quieter to compensate, which it also can with its quiet vinyl. Finding an equally spotless Harvest is hard even though mine is. This does however give the UK an edge in some harmonic detail. But speaking of edge it also has a somewhat more harsh sound to it. Grundmans cut is actually smoother and easier listened. By employing better mastering tricks it solves problems like sibilant S's which can be annoying on the original, as well as leaving less possibilities for lesser gear to mistrack closer to the label (IGD). And amazingly very little in terms of quality is lost here by effectively choosing what important aspects to highlight for the listeners pleasure like lessening some bass but still matching it in places where its needed and able to shine. In the end its a preference choice only and I feel both are winners, just like with WYWH and Animals that Ive also compared so far. But I would give the Reissue the edge here as its cheaper, has less distortion and is only an inch away from the original in terms of soundquality. Ive tested both A-1U / B-1U fully textured sleeve and A-4U / B-3U outside textured sleeve pressings and they are near identical in sound. Both will yeild that original bass filled sound with extra bite, be it with more sibilance, compared to the reissue. There is no poster as it is mentioned in the description. The poster in the images is from Dark side of the moon. It should be removed. I have this exact version (labels, sleeve) with the matrix numbers 04 917 A-3 on both sides. I'm impressed. My copy sounds fantastic, perhaps a little smoother than my folks' original, but great in its own way. Given how clean it was coming out of the sleeve, I gambled with not brushing it first, and there was still almost no surface noise! Perhaps my only complaint might be that the artwork looks more pixelly than I remember, but the original prints were somewhat grainy to start with. Does anyone with this version have gene etched in Side 1 too? Also, stamped MASTERED BY CAPITOL 0 (Jacksonville Pressing) on both sides? EDIT: Well, mine is the same runout listed here (plus gene etched in side 1), but with Harvest yellow/green label. Can't find the listing for this one. This one has a very god sound, try it with headphones!.